BARCELONA, Spain (AP) — The leader of Catalonia accused the European Union on Wednesday of “turning its back” on the Spanish region in its conflict with the central government over a disputed independence vote planned for Sunday that Spanish authorities have vowed to prevent. Puigdemont also told The Associated Press he intends to make the divisive matter of Catalonia’s independence into a European affair rather than just a domestic issue. “If the yes wins, I will make an appeal for the European community to become involved, because we will have won our right to be heard, something that hasn’t happened until now because the European Commission has always turned a deaf ear (to Catalonia),” the 54-year-old separatist leader said. No country, within or outside the European Union, has openly expressed support for the Oct. 1 referendum that Spain’s conservative government sees as illegal. U.S. President Donald Trump said Tuesday he thought it would be “foolish” for Catalans to break away from Spain. “Whoever doesn’t want to hear our voice needs to see a political otolaryngologist,” Puigdemont said, using the formal term for an ear, nose and throat specialist. Spain’s Constitutional Court, which has previously ruled that only central authorities can call such a vote and that all Spanish nationals should vote on sovereignty matters, has suspended the referendum. The pro-independence regional government has so far ignored court rulings and vowed to go ahead with the vote. Officials of the executive and legislative branches are under investigation and a heavy police presence has been assembled in the northeastern region as the day for Catalans to cast ballots nears. Madrid has launched an unprecedented crackdown to stop the referendum, including seizing paper ballots, removing referendum propaganda and ordering schools to be sealed off so they can’t be used as voting stations. Puigdemont told AP he thinks the effort to suppress the vote is boosting support for it in a way that European institutions won’t be able to ignore. On Wednesday, Spain’s National Court said it planned to investigate possible sedition charges for demonstrators who took part in a massive protest last week against a police crackdown on preparations for the vote. 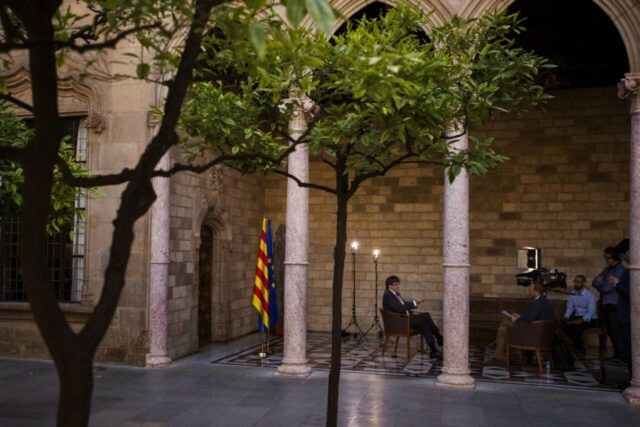 Regional leaders have said that if the “yes” side wins, they would be ready to declare Catalonia’s independence two days later regardless of voter turnout. But Puigdemont on Wednesday acknowledged that significant participation is needed to portray the vote as representative. He refused to disclose what percentage of the 5.5 million Catalan voters his government needs to declare the vote valid, but cited previous referendums in Spain, including the 2005 vote to pass the European Constitution that had a turnout of 42 percent. “Nobody raised concerns about the participation level in order to legitimate the results, so I hope there are also no concerns in this case,” Puigdemont said. Catalonia is one of Spain’s 17 autonomous regions. Its capital is the dynamic Mediterranean port city of Barcelona, a perennial favorite for tourists. With a population of 7.5 million inhabitants, its own cultural traditions and language, Catalonia contributes a fifth of the Spain’s 1.1 trillion-euro economy ($1.32 trillion). The vast majority of Catalans favor holding a referendum, but they have long been almost evenly split over independence itself. Separatist sentiment peaked at the height of the 2008 financial crisis, with many Catalans feeling they could do better on their own, but with the national and regional economies thriving again, polls indicate support for secession is on the wane. The region’s first attempts to hold a non-binding referendum in 2014 were blocked by Spain’s Constitutional Court. The Catalan government went ahead and staged the unofficial poll. About 2.3 million Catalans — less than half of those eligible — voted, with 80 percent favoring independence. AP writer Ciaran Giles contributed from Madrid.